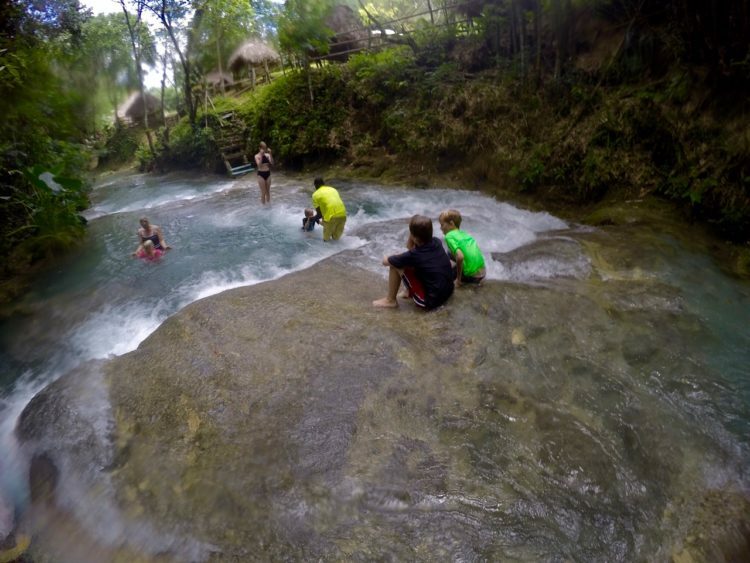 If you’re on the hunt for a Jamaican excursion that is off the beaten path, Barrett Adventures is sure to have the unique experience you’re looking for. 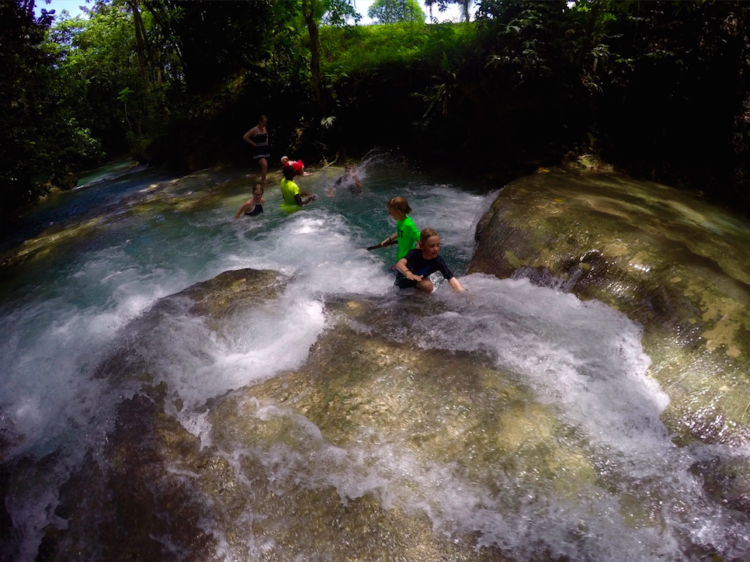 From sailing and snorkeling jaunts to hiking and tubing trips, the family-owned and operated Barrett Adventures plans truly unforgettable Jamaican getaways, manageable even for those traveling solo with small kids! 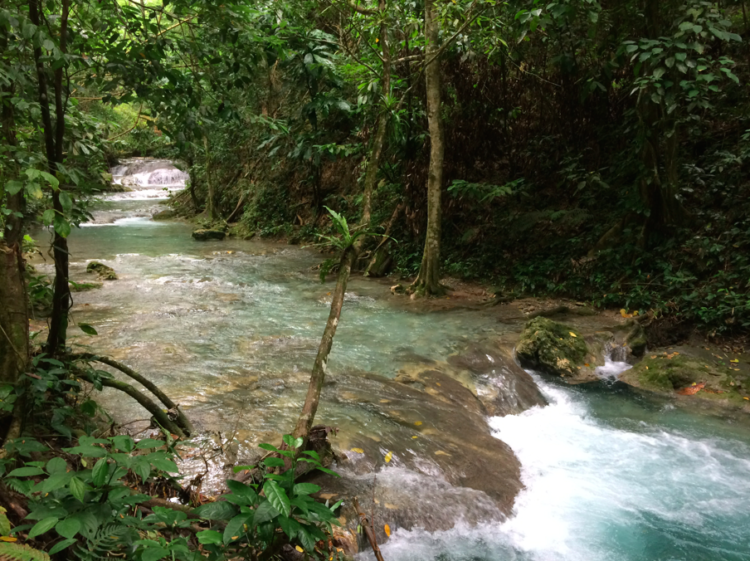 Mayfield Falls in Jamaica. Photo by Heidi Gollub, Big Family TravelingMom. 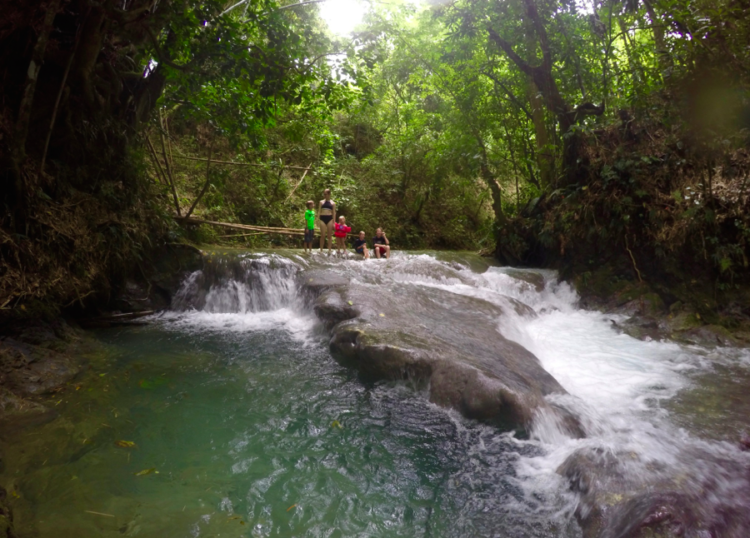 Booking our Carnival Cruise from Texas to Jamaica was the easy part. I was so excited. I told just about anyone who would listen my plan to take five children, ages three to 16, on a Caribbean cruise. It was going to be a vacation full of firsts for all of us: our first family cruise; our first visit to the Caribbean; the first time we would bust out the kids’ new passports; the first time I would venture into another country with all the children, but without my husband. That last one gave me pause. 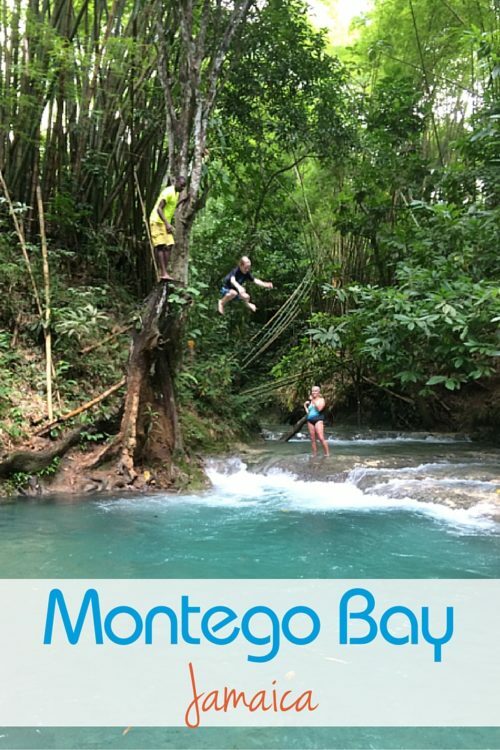 Especially since I didn’t actually know much of anything about Jamaica, or how to go about booking kid-friendly excursions for our day-long port stay in Montego Bay. So, I tamped down my trepidation and put the excursion part of our trip out of my mind. We were going on a cruise! After months of procrastinating, with our cruise date fast approaching, I was forced to make a plan. I looked up Barrett Adventures after a friend mentioned that she and her parents had both used the company in the past, and contacted the owner, Carolyn Barrett, to see what she would recommend. 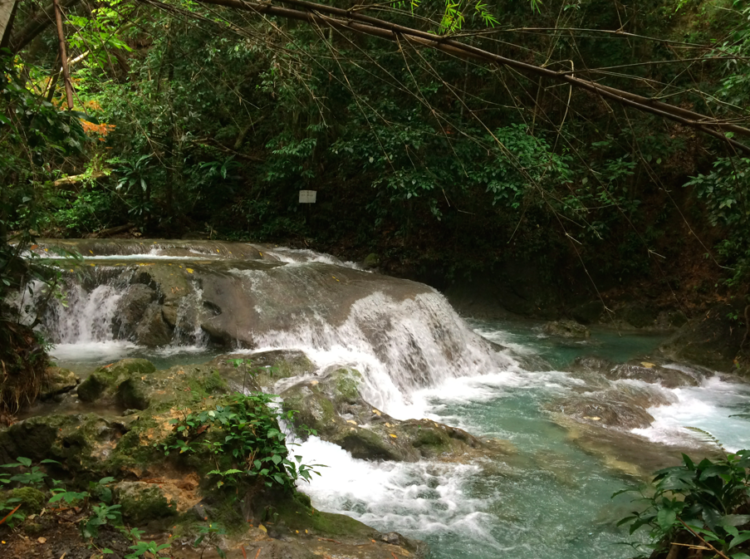 Was visiting Montego Bay with five kids in tow even a good idea? Spoiler alert: Yes. It was. If you visit the Barrett Adventures website now, you’ll see photos of my crew having the time of their lives, with Carolyn as our personal tour guide. 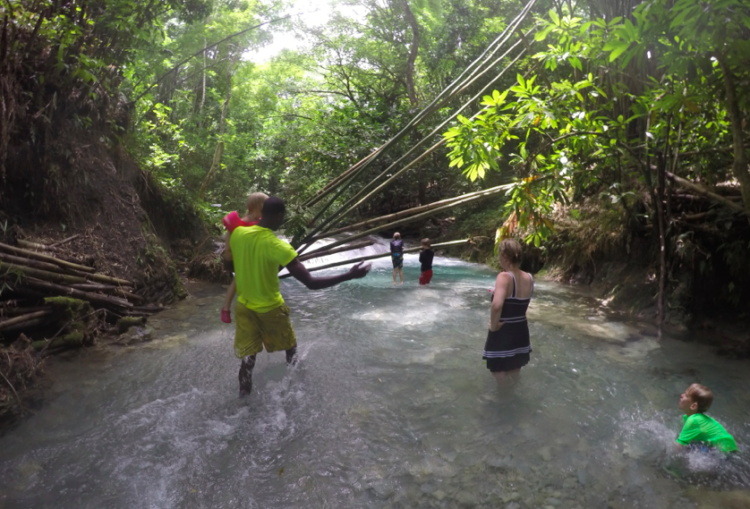 Our excursion in Jamaica turned out to be the unanimous favorite part of our summer vacation, so all that worry was for naught. Mayfield Falls. Photo by Heidi Gollub, Big Family TravelingMom. Mayfield Falls. Photo by Carolyn Barrett. 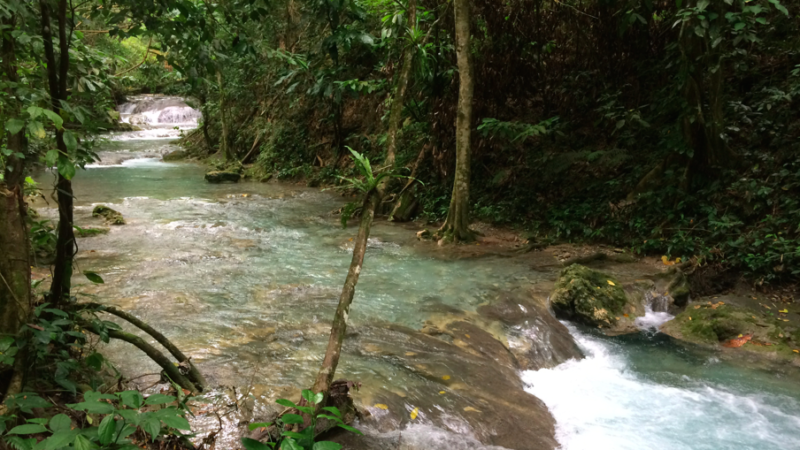 Carolyn picked us up from the Montego Bay port in the morning, and we hopped in her Toyota 4Runner with no idea what to expect. Not even that cars would be driving on the left. I wasn’t kidding about not knowing anything about Jamaica. But lucky for us, our personal tour guide was like a walking encyclopedia. On the hour plus drive to Mayfield Falls (a somewhat harrowing experience of narrow, winding, pothole-ridden roads, that Carolyn mentioned has been referred to as “Mr. 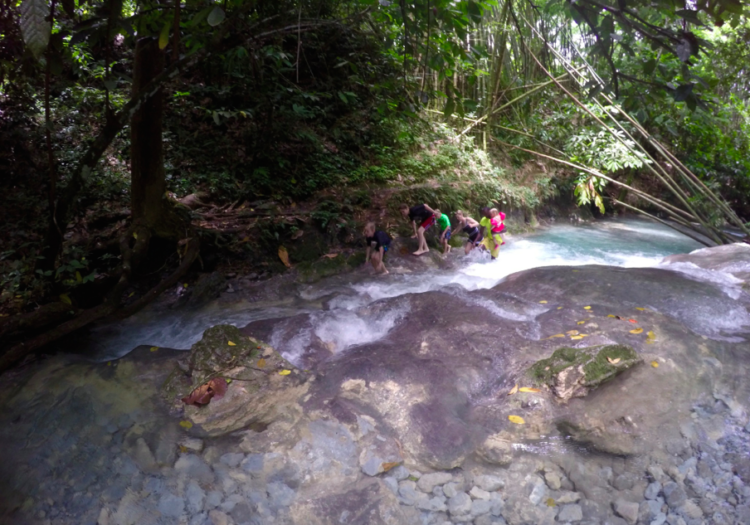 Toad’s Wild Ride”), we were regaled with stories about the history of Jamaica, the current state of the country, the education system, local holidays, regional animal populations, and even flora and fauna. Carolyn is an adventurous “almost 69-year-old,” who grew up in Lake Placid, but has be in the Caribbean now for 46 years, and in Jamaica for 27. Driving to and from Mayfield Falls with Carolyn as our tour guide turned out to be the most interesting (and educational) part of our day! Photo by Heidi Gollub, Big Family TravelingMom. 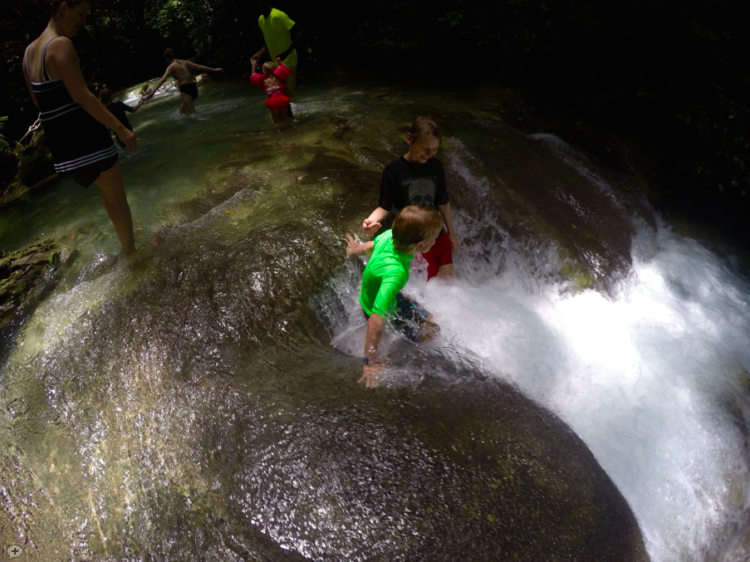 During the two-hour trek up Mayfield Falls, Chicken showed the kids every fun secret: where to swim through caves, how to hide under the falls, which trees to jump out of, and even the best technique for skipping stones. Chicken was part guide, part entertainer, and part toddler carrier (that’s the part I appreciated the most). 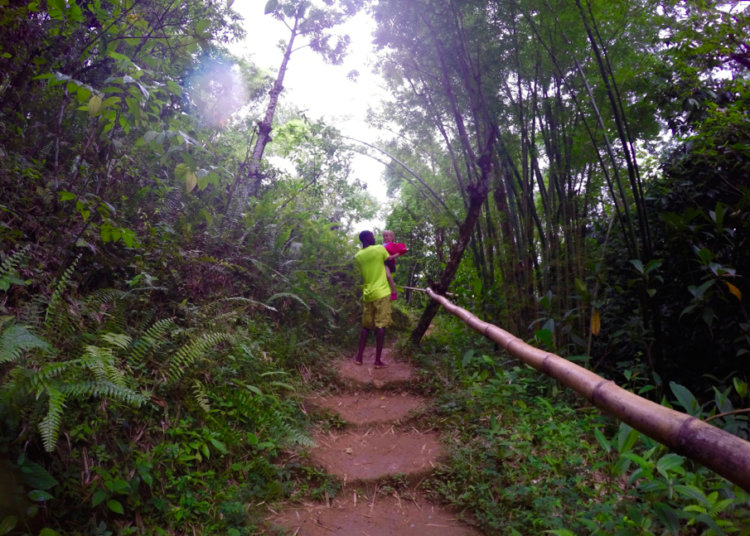 We walked at a leisurely pace and enjoyed every minute. 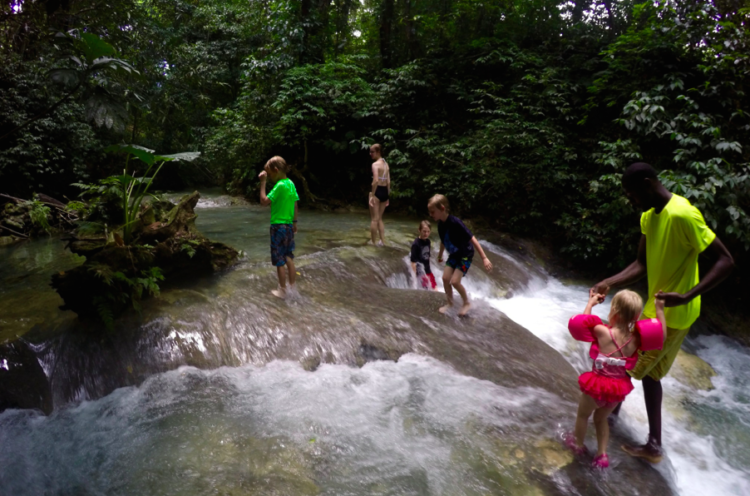 The scenery was breathtaking, the water cool and refreshing, and the kids had a great time exploring the new-to-them plants and critters they discovered along the way. The only thing I wish I had done differently was to follow Carolyn’s recommendation to bring water shoes. We didn’t, and our bare feet got a bit banged up by all the “rockys.” But, we all agreed that it was worth it! Crystal clear water in Mayfield River. Photo by Carolyn Barrett. After an amazing journey to the top of the falls, we took a short, half-mile hike back to the car. Chicken sang along the way and pointed out ferns and plants unique to the Caribbean. 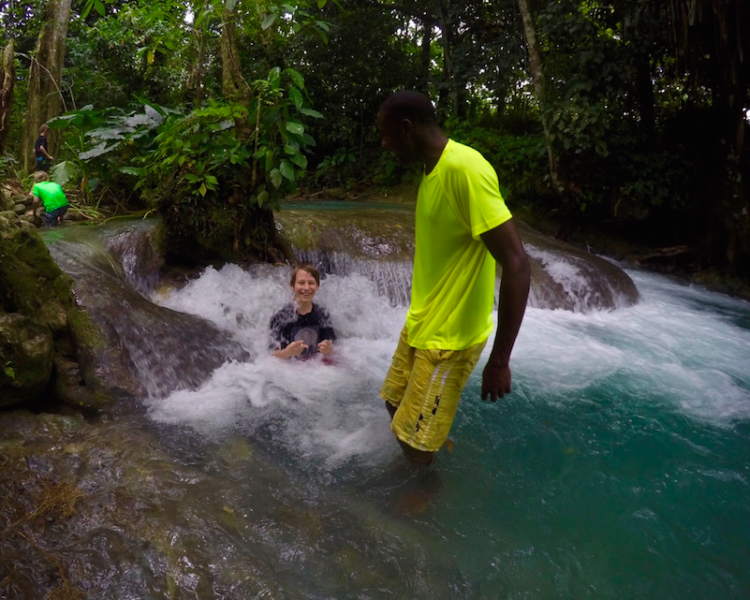 We didn’t want to leave our new Jamaican friend, but it was time to travel on to the second part of our excursion. Living in Texas, we’re no strangers to tubing. But the swift current on the Yardy River was something of a surprise. 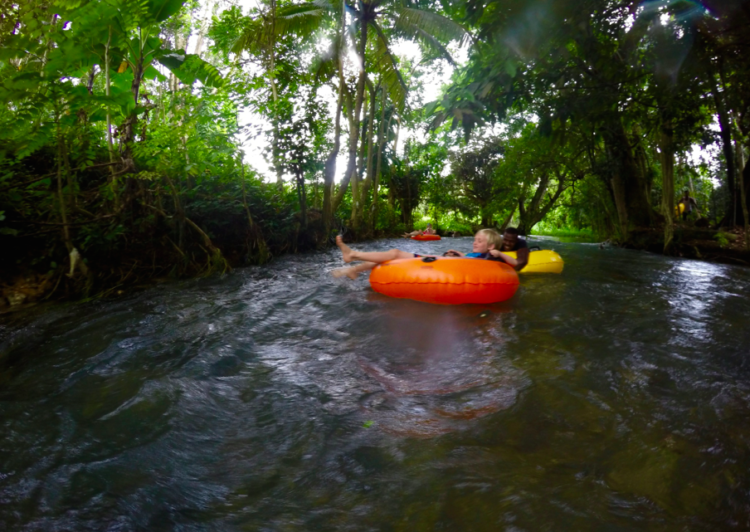 As soon as we hopped in our tubes, we were swept downstream (and into the riverbank, and the roots of trees). It was a wild ride. The kids loved it, but I was a bit nervous since all but the toddler, who rode with me, were not within arm’s reach. I was thankful for our new round of guides, who kept an eye on all of the kids as we raced down the river. Tubing in Yardy River. Photo by Carolyn Barrett. 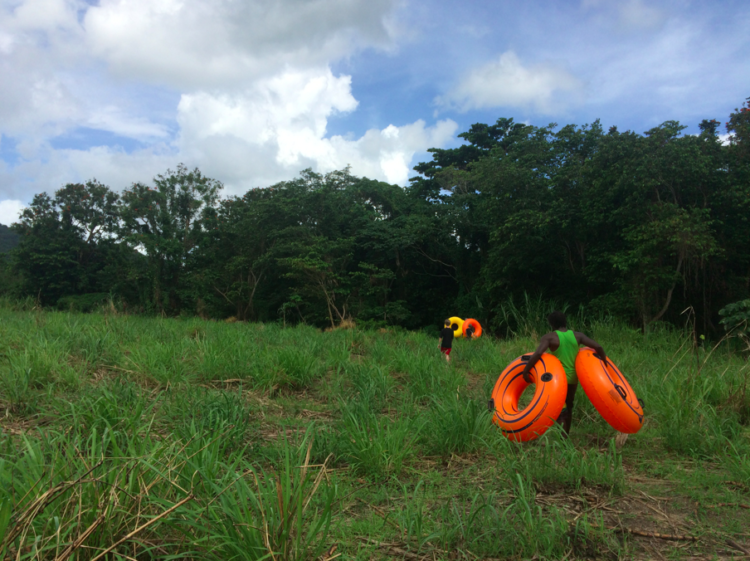 When we arrived at a section of the river where the rapids and small falls were dangerous for the uninitiated, we hopped out and walked through picturesque fields to a safer spot for the kids to have some fun. For boys, not much is more exciting than jumping out of trees. 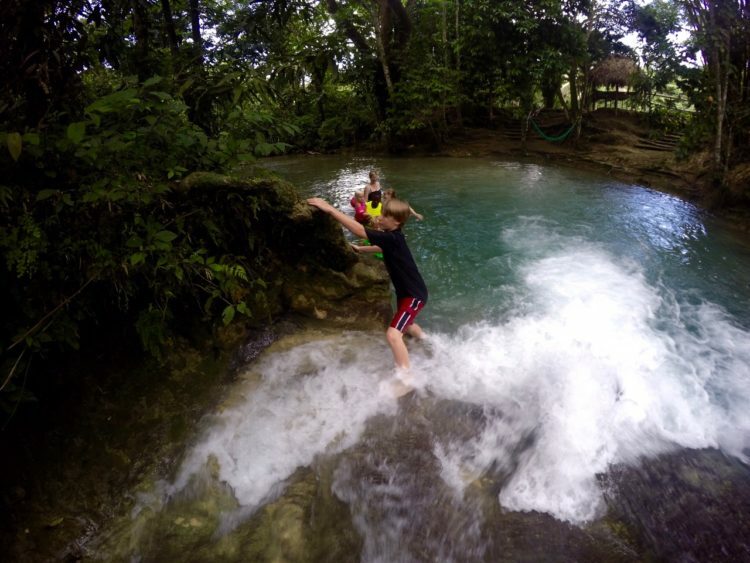 This natural diving board was a favorite. The kids jumped, flipped, and cannonballed into the water, time and again. 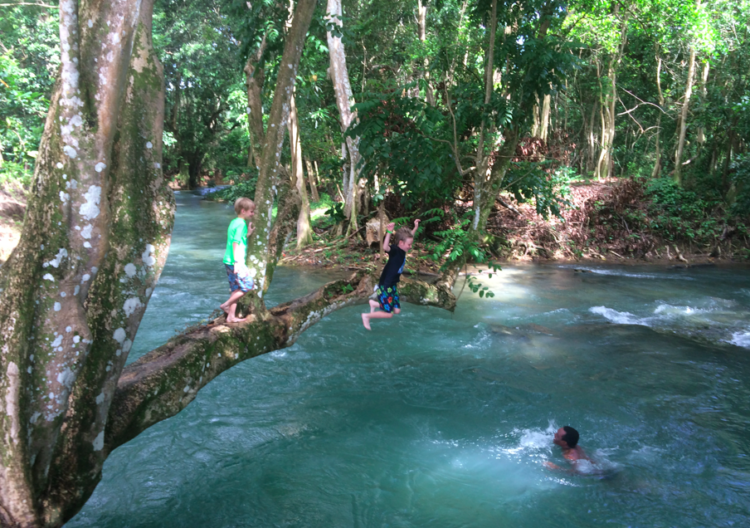 Tree jumping at Yardy River. Photo by Heidi Gollub, Big Family TravelingMom. Our day of adventure wore the kids out so thoroughly, all but the 16-year-old fell asleep in the car on the way back to the boat. That’s what I call a successful outing! Bring water shoes. Your feet will thank you. Bring lots of small bills. 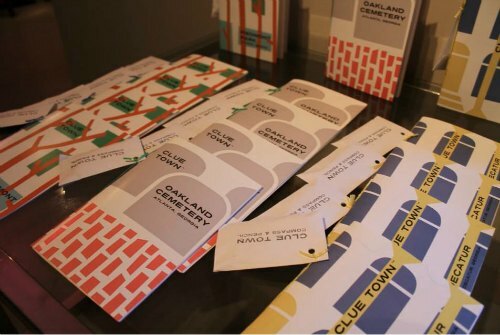 You may need money for lunch, plus money for tips (in our case: Chicken, the tube guys, and Carolyn), possibly water shoe rental, and vendors who approach you. Bring a waterproof bag for your phone/camera. Pack a backpack (we didn’t have one on the cruise, and I felt a bit ridiculous lugging around a small suitcase full of snacks). There are lockers at Mayfield Falls, so you won’t have to bring your backpack on the two-hour hike. Bring your own life jackets for kids who aren’t strong swimmers. For more information, contact Barrett Adventures or email Carolyn Barrett with questions. She is very responsive. 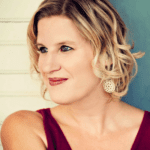 You may not get Carolyn as your guide, as she runs the business with her husband and stepson, but I hope you do! She is worth going all the way to Jamaica to meet. Previous Post: « 4 Reasons Why Your Family Must Take An Overnight River Trip! Such an exciting story — and what a confidence builder for family travel.